Thank you for saying what needed to be said! I've expressed the same concerns but only with myself and my closest friends. I've been riding Goldwings since 1979!! I've been a very loyal and happy owner of several Goldwings. In 2001 I hung onto my 1995 Apencade waiting for something more than what Honda offered. Make no mistake, the new 2001 model was a nice bike but it left me wanting more so I stayed with what I had. For a decade I was patient. In 2010 when the line moved to Japan I expected a totally new model. Nothing. It was the same bike. Then came 2012 and now 2015. I still have my very reliable and dependable 95' Aspencade, but after 14 years of waiting and dedication to the brand, I've made a very difficult decision to replace the Aspencade with the BMW K1600GTL. 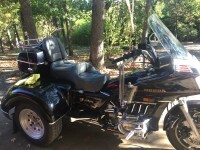 I'll miss my faithful Goldwing that's served me so well over nearly two decades. We've seen a lot together. Unfortunately though, the market has moved and Honda has not followed it. I can't wait any longer. I hope the old girl will forgive me for moving on. I hope you enjoy your K1600GTL just as much as you enjoyed your Wing. Just a few things to keep in mine when enjoying your new bike, K1600GTL have had problems with the drive by wire throttle, electronics on the left side failure, drive line lash and extreme pull to the left. I have no problem with the BMW, I think they are a great bike, I almost bought one before buying my 2012 GL1800 however, the wife put the stop to that after she rode on the back of it. Funny how many times the wife has made the final decision on which bike the driver would buy. I have heard the same story about every brand of motorcycle. I guess they all have a different definition of comfortable. In my mind I can live with what they have failed to add, it is what they have taken away that is so disappointing to me, and how cheap and flimsy assed the GL1800 has become. Someone I know bought a new Honda Civic this year for £5k less than the cost of a GoldWing, that is getting no more than an engine, frame, a cheap uncomfortable seat and a bunch of cheap and flimsy clip on plastic. I have had problems with sticking cruise on/off, faulty starter switch, hazard switch packed in, front brake switch. this is on a Goldwing that had covered 8k miles and only seen rain a few times. I had no such problems with my 23 year old 1500 that had done 60k miles. I cannot help but wonder how the 1800 will stand up when it is getting on for 25 years old. I am happy in the fact that riding Goldwings for more than 32 years I have seen them all released and rode them. The only reason I have a 1800 trike is because I was about to pay £15,000 to have my 1500 (Big Blue) triked when I was offered an 1800 trike and trailer with only 8k on the clock for the same money. Nothing can change my thinking that the only change in the 2015 Goldwing is whatever changes have been made, it is because it is cheaper to produce. It is hard to think of anything else they can do away with on the Goldwing to make it cheaper, but I bet they have somewhere. I have owned two goldwings over the last 22 years, an 87 ascendance and a 97 1500 se. In many ways the 87 was more advanced with the digital dash ,which I prefer, gear shift indicator, switches that didn't stick and a working clock! I bought the 97 from a friend in 2008 and though lacking some of the aforementioned technology it was smoother, stronger, no stator issues, and more comfortable for my wife. As to the 1800 I have never been tempted because I don't like the monocolor paint scheme, though that has gotten better, and I can't justify the price for something that doesn't blow me away and doesn't have basic instrumentation. The last few years I have demoed Victory and Indian and looked at BMW. If I had 30k to spend I would buy the Indian Roadmaster and keep the 1500 for riding with my wife. That's my take Honda, if your listening. For a forum that is hosting Goldwing enthusiasts, I am a bit taken back by the harsh opinions. I'm not quite sure what specifics Honda owners are looking for Honda to listen too as they are not expressed, only that Honda should listen to it's customers. Honda is arguably the most reliable motorcycle available. If it ain't broke, don't fix it. What specific technological upgrades is everyone referring to? A complete physical redesign is risky, such as the new Valkerie is not a Valkerie, to me. The 2015 Goldwing seems to be incorporating more black pieces which is cheaper manufacturing as fewer pieces need to be body color. In 2012 they did the same thing with silver pieces. I would rather have all red pieces but I can live with it. Honda simply offers the most reliable bikes at the best prices of most other bikes. If there is a style that I just don't care for I wouldn't purchase that bike. I am completely satisfied with my Goldwing, Fury and my wifes Shadow which is probably one of the best ever all time motorcycles, in my opinion. Gatorbait58 wrote: For a forum that is hosting Goldwing enthusiasts, I am a bit taken back by the harsh opinions. I have found that the majority of the members on this board are very passionate about their GoldWings, and I mean this in the most positive way. Occasionally this passion boils over when Mother Honda goes an messes with something, removes something, or something equally silly. Personally I really like the look of the new 40 anniversary bike, but it really has nothing special on it other than a neat paint job, and that is a bit disappointing. I am also not in the market for an 1800 so I have less of a stake in what happens with the new bikes. golden highway wrote: Funny how many times the wife has made the final decision on which bike the driver would buy. I have heard the same story about every brand of motorcycle. I guess they all have a different definition of comfortable. You know the old saying, or you should, "If momma ain't happy, nobody's happy." Face it guys, we're no longer a desirable demographic. Honda obviously does not think they can sell enough redesigned Gold Wings to justify the required investment. They would rather invest in sportier models for the younger and more desirable demographic so I guess we'll have to hope we can keep our old Wings flying until we're too old to fly them! 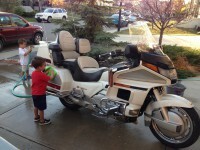 honda goldwing how do you improve perfect? steve84 wrote: honda goldwing how do you improve perfect? Well said! Every generation of Goldwing was perfect for its time, from the 1000 to the 1800. Everyone that still has their "first love" is right and everyone that stepped up as the newer models came out are right also. It's all in a person's taste (and pocket book)! Very disappointing that Honda is not the leader in developement of new tech in motorcycles. I love my 2003 Goldwing, andit use tobe when I got tired of hearing my friends tell me how out of date my bike was I could just pull on the throttle and leave them behind. Now my freinds are keeping up with me on there BMW and Victory and they have a lot of things I still can't get on the new goldwings. Sorry to say it may be time for me to look at different manufactures for my new bike. I understand the disappointment with the latest GoldWing not keeping up with the latest technology , I am also hearing the exact same disappointment with Honda's ST1300 on that forum. I currently have a '91 1500 and a '07 ST1300 myself. 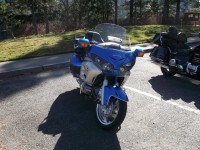 In 2008 , I was wanting something with newer technology and I bought a '08 BMW R1200RT. Immediately discovered it was a lemon ! It was predetonating at all engine speeds , even idle , ran rough , lousy mileage , and even though it supposedly had a 3 year warranty , local dealer and BMW would not acknowledge the problem and fix it in the 2 1/2 years I had it. Found out from others on the BMWMOA forum with the same problem , the predetonation was caused by a bad computer system that wouldn't read the anti-knock 2 sensors and correctly adjust the timing , and it caused piston slap by only 6K miles. It was destroying itself. I had to sell a basically new bike , as-is on ebay , to get it the he!! out of my life ! ( at a $6000 depreciation loss ! ) You couldn't trust it on any ride what with the 2 types of knocking going on . Fortunately , I had kept my trusty old GoldWing , didn't trade it in , since it was still running perfect after all those years and much better running and comfortable than a brand new BMW even though the BMW was roughly twice the price of the GW. Incidently , I also had a '81 SilverWing then and IT still was running better than the BMW- ( for 1/10th the price ). I sold the old Silver after the BMW and bought the ST for half the price of the BMW and man does that bike run smooth for a 4 cylinder ! And handle . Now , even though they aren't the latest in "technology" - I want reliability the most and I'll be using them until I'm too old to ride anymore , the BMW's 2 1/2 years of he!! , at least taught me that lesson. I have been keeping up on these posts and am surprised at the disfatiction being voiced by Goldwing owners. I have only been riding for 5 years and have had 6 bikes, the last of which is an 06 Goldwing. I wouldn't go to any other bike no matter how techie it was. 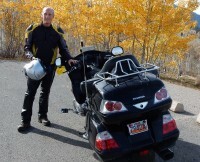 I love reliability and longevity and my 06 Goldwing has it. You can have all that fancy techie stuff but it doesn't make the bike run better or smoother and definitley makes it less reliable. Honda has never been a high tech company with any of their products, but they run forever. If you love fixing your bikes and spending time at the dealer then don't buy a Goldwing. You will be much happier with a BMW or Victory or Kawasaki. Try putting 50,000 miles on one of them with no down time or repairs. I prefer to ride rather than spend my time in the garage or driving back and forth to the dealer. When looking for a Goldwing I couldn't believe how many miles they had on them. People buy them to ride not sit in the garage. And after owning one I see why. When you get on one you don't want to get off. The smooth powerful motor, awesome comfort and excelent handling just beg to keep going. I would have never considered buying any other bike with 33,000 miles on it but that is what I had to do to get a newer Goldwing in my price range. And let me tell you it hasn't given me one ounce of trouble in a year and 7,000 miles. The only thing I wish was standard on the Goldwing was Bluetooth connectivity but I have solved that problem with Sena products. So all of you who want all that techie stuff go buy another brand and I bet 90% of you regret it and most of you will come back to a Goldwing. Some of us who have been through the ringer aren't leaving nor are we complaining about how Honda makes their Goldwings. We just hope they keep making them. Best of all my wife loves the passenger comfort and won't let me leave her home. Now that is my kind of woman. So I say quit complaining and go ride the best motorcycle ever made. No one makes a bike with the comfort, handling, power, reliabilty and longevity of a Goldwing. I love mine. Yes, it would be nice to have a plug that brings your devices music menu up on the display...like Victory has...and why can't they get the MPG up over 40? That's about all I have to say I guess. Other than the fact we've taken two 4000 mile summer trips now and the Wing has performed flawlessly. Zero hiccups. Awesome!! Isn't there a silence before a storm? When the GL1500 was nearing it's end of run, didn't many see a slowdown in new items and technology? Also didn't the parts become less quality? Isn't this now happening to the 1800? I don't own one nor do I have an inkering to so I'm not following it as close as the 1500. "we're no longer a desirable demographic. Honda obviously does not think they can sell enough redesigned Gold Wings to justify the required investment"
We're not out of this economic turn-down so why would any major manufacture stick it's head out for something that MIGHT be a slow seller. That does not make good business sense. Simply plod along until times are better and profits can pay for a new model. That can be it's demise also. Windjammer was literally the only fairing mfg for big bikes, then Honda built there own. Can it not be said the same thing may happen for GoldWing? Two wheel tourer, 3 wheel tourer, reverse trike tourer, 6-Cyl and 4-Cyl tourer or maybe a 6 and 2 cylinder models? In different threads and websites that's been a growing possibility. Some want larger, others want smaller and simpler. OK, so let's say "WHAT IF" GoldWing was to be no more. What would your next tourer be? Triumph - BMW - MoTo - Moto Guzzi - Yamaha V-Max 1700 - ? ? ? It would be a toss up between the Yamaha and the BMW. I might lean towards the Yamaha for the reliability as hard as that might be with BMW'S technology. Victory Vision Tour, no question. I would go with the Yamaha Venture V4. Owned a Tour Deluxe just prior to buying my wing and loved it. 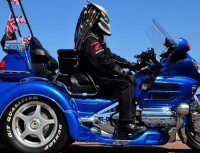 It wasn't nearly as comfortable and powerful as my Goldwing but was totaly trouble free and ran like a top. Have a friend who is a Honda mechanic for 30 years who drives a 96 GL1500 and he said he thought they were a little top heavy but he had never seen one in the shop. Before deciding on the Wing I test road an early Yam-Venture. Even tho I only road it in there parking lot and did a couple of figure 8's I knew that model wasn't for me or for us. It just didn't feel right for comfy lonoooooooog rides. I was hoping the Yam-1700 could be since I like the V-4 sound and torque. But again, it's not to be. Can anyone envision this V-Max with a full set of saddle bags and fairing? If no new GoldWings ? Well I sure wouldn't try a BMW again - NO Way . A well taken care of 1800 GoldWing most likely. TourNut wrote: If no new GoldWings ? Well I sure wouldn't try a BMW again - NO Way . A well taken care of 1800 GoldWing most likely. A well taken care of 1500 Goldwing. Let's start that conversation again!